Glyco-Flex Mini Chews contain glucosamine for small dogs. These bite-sized chews also contain perna mussels, MSM and manganese to help reduce inflammation, hydrate healthy joints and strengthen cartilage. Glyco-Flex III Mini Chews is recommended for small dogs with advanced joint pain and stiffness and dogs recovering from injury or surgery. The high levels of nutrients in Glyco-Flex III help to support recovery and improve connective tissue health. These great tasting bite-sized chews contain glucosamine, perna mussels, MSM and manganese to help reduce inflammation, hydrate healthy joints and strengthen cartilage. 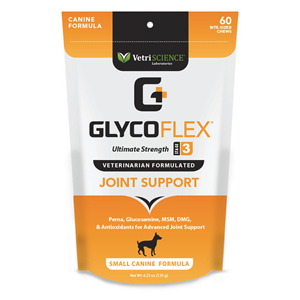 Glyco-Flex supplements contain the highest quality form of glucosamine. Glucosamine is present in all living animals, with a high concentration found in cartilage. 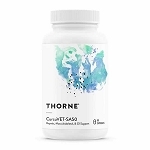 As an animal ages, or when there is damage to cartilage, they often aren't able to synthesize enough of their own glucosamine, that is when a glucosamine supplement can help. Each bag contains 60 chews. Was exactly what I ordred and quick. My pet has been on thesse for couple of years. Great product, price, and shipping experience. Thank you Holistic Pet Info! I'll be back! Perna canaliculus, or green-lipped mussel, is an edible shellfish containing protein, minerals, glucosamine and Eicosatetraenoic acids (ETAs). 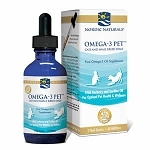 ETAs are a type of Omega-3 fatty acids and provide an anti-inflammatory effect which helps reduce joint pain. Research in both humans and animals have shown that perna mussels have been effective in managing degenerative joint disease and arthritis. Human patients receiving perna mussels reported less pain, joint stiffness and improved mobility. DMG is used to support proper immune response, cardiovascular and skin health. Vitamin C is important for the synthesis of collagen and the repair of connective tissue. Vitamine C, Vitamin E, selenium and manganese are often added to joint supplements for the enzymatic benefits and to assist in the transportation of chondroitin and glucosamine to joint tissue. Manganese is a trace mineral that activates enzymes responsible for nutrient utilization. 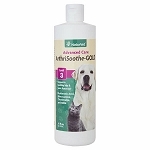 It is added to animal supplements to help aid in the uptake of glucosamine. Grape seed extract is a powerful antioxidant with anti-inflammatory properties. Antioxidants destroy free radicals - free radicals cause much of the damage in inflammatory and degenerative diseases. Glutathione assists in regulating immune response. Research has shown that increased levels of glutathione can reduce inflammation and joint pain. Selenium has antioxidant properties that protect cell membranes. It is also used in the body for the production of glutathione peroxidase, an enzyme that works inside the joints to round up free radicals. Inactive Ingredients: arabic gum, brewers yeast, canola oil, chicken liver flavor, citric acid, glycerin, natural mixed tocopherols, propionic acid, proprietary blend (maltodextrin, sodium alginate, calcium sulfate), rosemary extract, silicon dioxide, soy lecithin, vegetable oil and water. Give 2 chews per 10 lbs. of body weight, daily. Give 1 chew per 10 lbs. of body weight, daily.